section in the local supermarket. Cover with a cloth and keep warm. 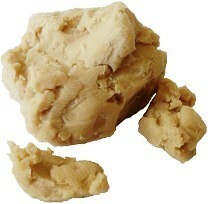 Make a total of around 300mls of the yeast suspension according to the recipe. In a large mixing bowl, add the flour. Make a well in the middle and put it in the microwave oven for 30 seconds - this is so that when the yeast suspension is added, it is not cold. Put the sunflower oil in the well and add the yeast suspension. 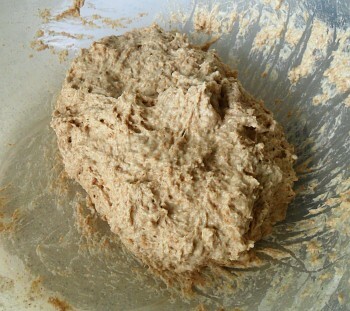 Using a fork, mix the ingredients well until the mixture starts to become doughy - this should be a lot stickier than bread dough. Cover with a dry tea towel and put to one side in a warm place. Also, put on the deep oil fryer and set the temperature to 165 Celsius. Whilst the dough is rising, you need to sort out the jams that you are going to use and how we are going to get them into the doughnuts we are going to make. the syringe we will be using. The syringe in the picture on the right is meant for injecting liquid into meat whilst it cooks so make sure you buy a new one if you are going to get one of these - I bought it from a Lakeland shop in the city centre. It comes with two needles that are dangerously sharp so make sure that you never let children get lose enough to touch it or, when it is not in use, store it in a place where children cannot even see it. Of the two needles, I suggest using the larger of the two. Any jam needs to be able to pass down this needle therefore the smallest particle size in these needs to be fairly small. The jams that I chose to use here are apricot, seedless raspberry and guava. In the jar, they are too viscous - they are meant for sticking to a flat surface that they have been spread onto - and the apricot has larger bit in it. 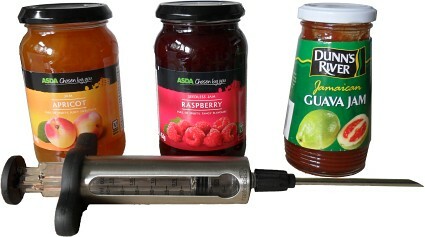 To make the jam runny enough to inject, we need to add water to it. For all of the doughnuts in this recipe, we need around 150g of runny jam in total. To make that, you need 120g of jam and 30g of water. In a small container, weigh in the jam and then the water and using a fork, mash the water into the jam until the consistency becomes even. This should be runny enough to inject into the doughnuts. I used the three jams suggested here so I used 40g of jam and 10g of water in each case. The other problem is that of pieces in the jam that are too large to pass down the needle. This is the case with the apricot jam and all you need to do is to press it though a sieve, using the back of a spoon. if you have a lot, agitate the basket. Now that the dough is ready, get a fork and stir it around - effectively, you are kneading it but doughnut dough is so sticky that you wouldn't be able to kneed it by hand. Once it is ready, wet your hands and pinch off small pieces - big enough to make a sphere around 2cm in diameter - and lower them into the oil. Cook around eight at a time - this means that you can produce enough but if you did many more, the difference in cooking time between the first and last in would be too long. 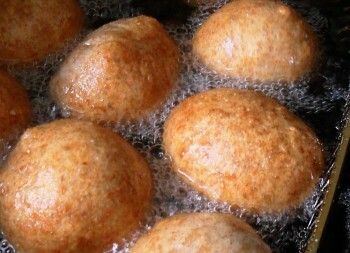 When they are golden brown, drain them and put them onto some paper kitchen towel to soak up any excess oil. Caster Sugar and inject the jam. Next, put them in a bowl, line with more kitchen towel and sprinkle some caster sugar over them. Pick up the bowl and move it around in a circular motion so that the doughnuts roll around, picking up the sugar and coating themselves evenly. 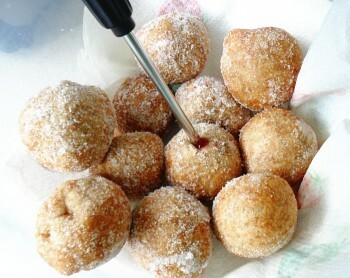 Finally, fill the syringe with the runny jam that you want to use - I found that unscrewing the needle and filling it then screwing the needle back on worked best - and inject around 2 - 4cm3 into each doughnut worked the best. You can often see them swelling up and when jam starts to come out of the hole you have the needle in, you know that is all it can take. 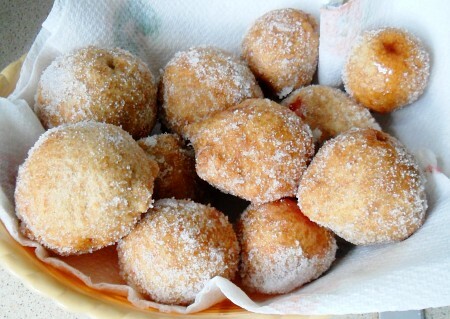 Put the finished doughnuts in an open-topped container and when you want to take them to work, put them in a paper bag or make sure that they are completely cold before you put them into a plastic container because they will sweat and the sugar coating will dissolve. flour, they must be healthy ;-). This recipe made around 30 doughnuts but they are so nice.